Let’s put Willy Wonka back in the Chocolate Factory, M’kay? Willy, will you just go away? 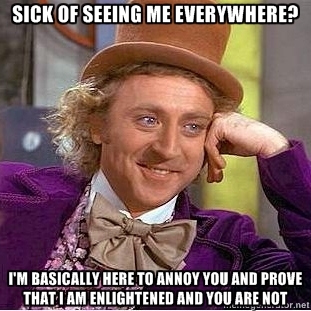 Pretty much every day one of my Facebook friends, sometimes multiple Facebook friends, is posting a picture of Willy Wonka (Gene Wilder from the original Willy Wonka and the Chocolate Factory, released in 1971) who is imperiously but smirkily telling me some perceived truth about the universe or human behavior. Willy never makes me laugh. Instead, Willy makes me want to slap his face silly, and I like Gene Wilder. He’s been the star of some of the funniest movies ever made, including The Producers and Young Frankenstein. He has got the crazy, manic but funny guy down cold. In fact, he owns this peculiar market. I’ve seen his Willy Wonka movie and it’s a decent one. It’s not the sort of children’s movie that you usually get in theaters and is delightfully subversive and naughty. Now granted, I can be imperious too. Unlike some of the posters of these Willy Wonka memes, I am comfortable with the notion that I have imperfections. The impression I get is that many of those posting these Wonka captioned photos are that you want to lord it over us that because you feel you are our better. Only you cannot say so directly, so they let Willy tell you instead in his smirky, smarmy and captioned way. They “Share” it on FB as a joke, you see, but not because they actually mean to point fingers at you personally. Ha ha! It appears to be more likely they have some contempt toward some group not at all like them because they don’t do what they do, and they know better. You can scan the WW meme site for plenty more of these, but among those that I have seen in Facebook personally are from vegans castigating people for eating meat, gun nuts, anti-gun nuts, Christians, anti-Christians, atheists, Democrats, Republicans, Tea Partiers, very skinny people upset that there are fat people out there without their ability to control portions, drunks, the abstemious — you get the picture. In case you don’t it won’t take you too much viewing of the WW meme site to figure it out. To put it politely, there are people out there with an axe to grind and hurt to inflict, and they are really quite upset and would prefer to hack away but they’re too nice. So they need a passive aggressive solution and use Willy Wonka to speak for them instead. Which means, of course, that these posters are just as flawed as the people and groups they are indirectly skewering. Which is sort of the point of this post. We all have flaws. None of us are perfect, unless you count sons or prophets of God. So just by posting these Willy Wonka pictures, you are acknowledging a deficiency in yourself that you are probably too blind to see in yourself. The same goes for the rest of you. Gun nuts: not all of us who are for gun control want to live in a society where only police have guns. We just think that maybe having semi-automatic weapons with extended clips that can fire thirty shots in fifteen seconds is a bit too far when our founding fathers had inaccurate and slow to load rifles that depended on sparks from flint to work. Gun control nuts, acknowledge that there are plenty of responsible gun owners out there who don’t feel the need to turn their basements into arsenals or carry their assault rifles into Safeways in Charlottesville, Virginia. Christians, we unchurched understand you think we are going to Hell. We’ll take our chances. Atheists, as an agnostic I tend to sympathize with you guys, but you are as annoying and dogmatic as a born again Christian. The bottom line is there are a lot of hurting people out there, so don’t keep piling it on, m’kay? And let’s put Willy Wonka back into his chocolate factory where he belongs and get him out of our meme generators. Most mass murders are preventable. For God’s sake, let’s prevent them.